From 1985-2015 OECD public expenditure on labour market policies averaged 1.7% of GDP  (OECD 2018), a substantial amount. However, the search and matching framework, the most common approach to understanding labour markets, is generally insufficient to provide sharp policy recommendations on directing these resources. Precise prescriptions out of these models often depend on key assumptions concerning how labour market agents interact. In particular, a critical choice researchers make in their models is whether job search is random or directed. A canonical model of random search is Pissarides (2000), where workers lack specific information about jobs and randomly send their applications to vacancies. Wages do not influence applications since they are bargained after the match is formed. In contrast, under directed search, jobseekers have information about specific job offers and can target positions with higher announced wages (Moen 1997) or a particular market segment where employers seek specific requirements (e.g. Menzio and Shi 2010; Menzio, Visschers and Telyukova 2016). Researchers often pick random or directed search based on analytical convenience and theoretical implications rather than the alignment between theory and evidence. However, understanding deep underlying behaviour matters for prescribing policies. Since it is often possible to construct models generating similar predictions based on different premises, evaluating competing models based solely on indirect empirical implications is often insufficient. Distinguishing between these alternative settings is important because labour markets should become more efficient if jobseekers direct their search. Under directed search, job seekers internalize congestion externalities by realizing the trade-off between the wage and the likelihood of being hired. Thus, many labour market regulations may be welfare-improving under random search, but not under directed search. For instance, Moen and Rosen (2004) show that poaching activity does not distort training decisions under directed search. In contrast, Acemoglu and Pischke (1997) find that training subsidies increase welfare because poaching induces suboptimal training investment under random search. For other policies such as minimum wages and unemployment insurance, several papers show welfare-improving effects under random search (Acemoglu and Shimer 2000, Flinn 2006). In our recent paper (Banfi and Villena-Roldán 2018), we use proprietary data from a Chilean online job board, www.trabajando.com, to empirically test if search is directed or not. In general, this is challenging because most employers do not explicitly post wages, and if they do, the advertised positions are clearly different from those in which wages are not revealed. This is relevant since hidden wages account for 86.6% of all job ads in our data and nearly 80% in comparable websites in the US (e.g. www.monster.com and www.careerbilder.com) and China (e.g. www.zhaopin.com). In contrast, we investigate the behaviour of applicants facing offered wages even if employers choose not to show them in the job ad. As researchers, we observe all wage data because prospective employers must report a net monthly wage to the website, even if they choose to conceal this information from prospective applicants. Only 13.4% of ads in our sample report expected wages to applicants. With this information we assess whether high-wage job ads attract more applicants than their otherwise identical counterparts. Using our estimated model, in Figure 1 we show that explicit-wage job ads with higher wages receive more applicants, everything else equal. The rationale is clear: as the wage increases, more jobseekers apply and reduce the likelihood of getting a job for all applicants. Lower-wage jobs can coexist with their high-wage counterparts precisely because they are easier to obtain. 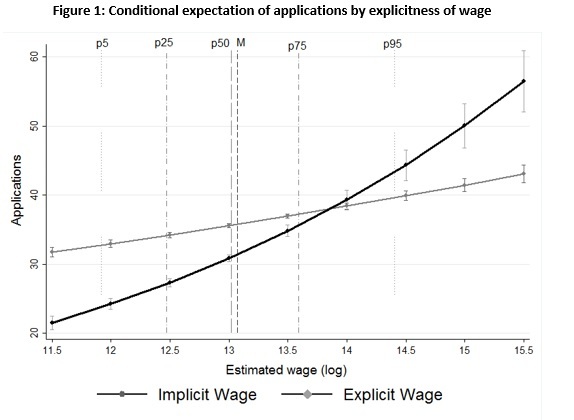 As depicted in Figure 1, we also find milder directed search for implicit (hidden) wages, suggesting that ad texts and requirements tacitly convey wage information. For low wages, we observe that implicit wage ads noticeably increase the number of applicants with respect to explicit-wage ones. Our interpretation is that hiding wages conveys positive information about the quality of the job or allows the employer to signal potential bargaining, in line with Michelacci and Suarez (2006). We also show that explicit-wage ads typically seek unskilled workers. Therefore, other estimates in the literature ignoring hidden-wage ads most likely overestimate the response of applicants to wages. Moreover, job ad requirements are aligned with applicant traits, as predicted in directed search models with heterogeneity. In Figure 2, we fit a regular linear model and a flexible specification (Local Polynomial Regression) between the averages of the expected log wage of individuals applying to a job and the corresponding log implicit wage of that job ad. We also show a 99% confidence interval for the estimates to assess the strength of the relationship. The positive alignment between applicant wage expectations and hidden wage job offers is clear and positive except for extreme wages. 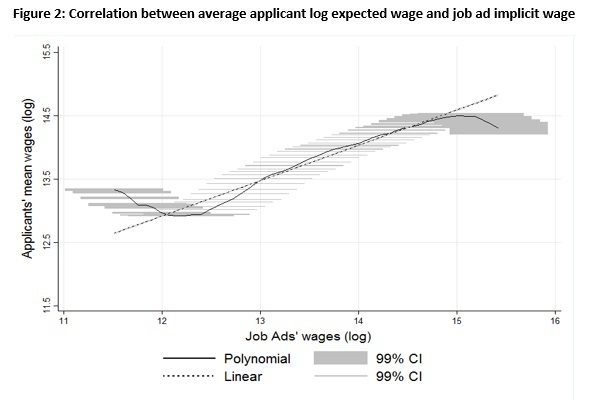 In line with the endogenous segmentation implied by directed search behaviour, implicit-wage ads attract applicants with similar wage expectations as shown by the modest width of confidence intervals. Although the website provides coarse filters using hidden wages, we argue that jobseekers are likely to make accurate guesses. For job ads with log net monthly wages above 13.8 (approximately 1 million Chilean pesos or 1,660 US dollars), the search filter provides very wide brackets of 0.5 million pesos above that threshold, leaving significant uncertainty that jobseekers on average match with quite successfully, as per Figure 2. In the paper we also show similar patterns of applicant compliance to job ad requirements in terms of educational area, educational level, and experience. This evidence shows that jobseekers react to information posted by employers on this job board. Other findings in the literature reach a similar conclusion (Dal Bó, Finan, and Rossi 2013; Marinescu and Wolthoff 2015). While job search through job boards has peculiarities that makes a straightforward generalization too risky, online job search is becoming increasingly important and efficient (Kuhn and Mansour 2014). Taken at face value, our results suggest that policy design should consider the prescriptions of directed search models often implying little or no regulation for the labour market. However, our evidence also shows that relevant features of these markets are not well-captured by existing models. Hence, the optimality of policy prescriptions arising in the current directed search literature is not guaranteed. In an upcoming paper (Banfi, Choi, and Villena-Roldán 2018) we uncover further evidence on multiple applications, multiple screening, on-the-job search, and multidimensional job requirements. While these are issues normally arising in online job boards, they have not been thoroughly examined in existing models. Finally, beyond labour market efficiency implications, a practical lesson is that there is a large scope for strategic communication and job ad design in order to attract the kind and number of applicants firms desire. This is important since hiring involves a costly selection process among heterogeneously productive workers, especially for skilled workers. 1. These expenses include public employment services (PES), training, hiring subsidies and direct job creations in the public sector, as well as unemployment benefits. Acemoglu, D. (1997). Training and Innovation in an Imperfect Labour Market. The Review of Economic Studies 64(3), 445–464. Acemoglu, D. and R. Shimer (2000). Productivity Gains from Unemployment Insurance. European Economic Review 44(7), 1195–1224. Banfi, S. and B. Villena-Roldán (2018). Do High-Wage Jobs Attract more Workers? Evidence from the Online Labor Market. Accepted in Journal of Labor Economics. Banfi, S., S. Choi, and B. Villena-Roldán (2018). Deconstructing job search. Mimeo. Dal Bó, E., F. Finan, and M. A. Rossi (2013). Strengthening state capabilities: The role of financial incentives in the call to public service. The Quarterly Journal of Economics 128(3), 1169–1218. Flinn, C. J. (2006). Minimum Wage Effects on Labor Market Outcomes under Search, Matching, and Endogenous Contact Rates. Econometrica 74(4), 1013–1062. Kuhn, P. and H. Mansour (2014). Is Internet job search still ineffective? The Economic Journal, 124(581), 1213-1233. Marinescu, I. E. and R. P.Wolthoff (2015). Opening the Black Box of the Matching Function: The Power of Words. Discussion Paper 9071, IZA. Menzio, G. and S. Shi (2010). Block recursive equilibria for stochastic models of search on the job. Journal of Economic Theory 145(4), 1453 – 1494. Menzio, G., I. A. Telyukova, and L. Visschers (2016). Directed search over the life cycle. Review of Economic Dynamics 19, 38 – 62. Special Issue in Honor of Dale Mortensen. Michelacci, C. and J. Suarez (2006). Incomplete Wage Posting. Journal of Political Economy 114(6), 1098–1123. Moen, E. R. (1997). Competitive Search Equilibrium. The Journal of Political Economy 105(2), 385–411. Moen, E. R. and A. Rosén (2004). Does Poaching Distort Training? The Review of Economic Studies 71(4), 1143–1162. OECD (2018), Public spending on labour markets (indicator). doi: 10.1787/911b8753-en (Accessed on 25 January 2018). Pissarides, C. (2000). Equilibrium unemployment theory. MIT press.